How Does Dry Ice Ship? How does dry ice get to your doorstep? At Dry Ice Corp. we love using dry ice to ship a whole variety of things. It does a fantastic job of keeping food fresh, keeping frozen things frozen, and keeping anything cool over long distances. How can you use dry ice to ship your goods? Shipping food or perishables in the mail requires you to have dry ice in the container, properly contained, and properly labeled and paid for. Since food is the most commonly shipped thing with dry ice, we will go over the steps for shipping that! 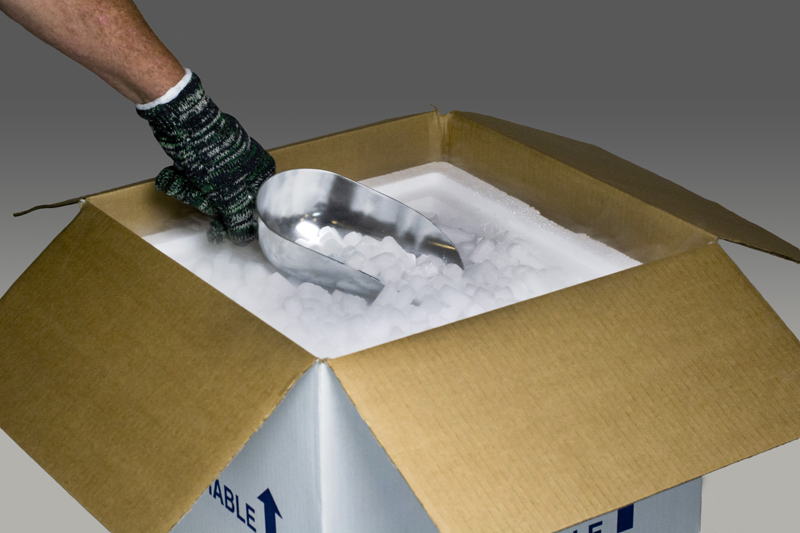 To ship easily, purchase pre-sealed packages of dry ice that work well in shipping containers. These are specifically designed to prevent any leaks and to keep your food safe throughout the transit process. Dry ice is ideal for shipping food, as it won’t get the contents wet during the process. If you ship with ice packs instead, they will melt and leave dew or condensation on the products inside. Dry ice is colder, which makes it especially ideal for shipping products that can easily spoil. How Should I Pack the Food? Make sure that you buy the right package. Ideally, you should purchase a sturdy corrugated cardboard box that can stand up to rough handling. Add a layer of Styrofoam to the inside of the box, whether it’s a Styrofoam cooler or Styrofoam inserts. Styrofoam that is 2 inches thick will properly insulate the food and keep everything cold. Use gloves when handling the dry ice and place it on the bottom of the cooler. Wrap your perishable food securely and place it on top. Alternate between layers of dry ice and food, filling in extra space. Make sure that you don’t completely seal the container, otherwise, it could explode during the shipping process. This entry was posted on Friday, January 20th, 2017	at 12:58 PM	and is filed under Shipping with Dry Ice	. You can follow any responses to this entry through the RSS 2.0	feed. Both comments and pings are currently closed.